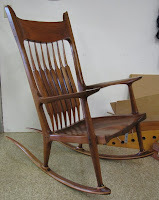 The topic was "Sam Maloof style rockers" at last night's woodworking club meeting. Two people presented: one who had visited Sam's shop twice and had built one of his rocker's a decade ago, and another who had just returned from taking a class at Marc Adam's School of Woodworking. Much time was spent discussing the joinery that is required for building these rockers. The rockers themselves are constructed with laminated strips of hardwood which are glued together and bent to position using a form. 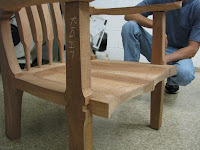 The arms are doweled to the legs and the legs are doweled to the rockers. T he back spokes are rough-cut at the bandsaw and then finished with rasps and spokeshaves. The seat is built with 5 boards which are doweled together and shaped with 16 grit sandpaper. The legs are attached to the seat with tongue and groove joinery and can be glued, screwed and pegged or merely glued. The crest rail is joined with dowels or biscuits. The fluid lines that create the graceful shapes are both hard and soft edged, adding the distinctive look characteristic of Maloof rockers. After the meeting, my friend who had just taken the rocker class filled me in on the daily activities, the famous woodworkers he had met, the 10-14 hour days, the cam araderie, the extreme focus, the great lunches prepared by Marc's wife, and Marc's generous and high energy nature. Only recently has my friend started taking classes. For years he thought "What can they teach me that I can't learn in a book?" I think many of us believe the same or have trouble justifying the expense of classes and materials cost. That, combined with travel expenses and room & board, and the price really adds up. I took my first woodworking class with David Finck about 8 years ago on handcut dovetails where each of us made a sliding lid box. I learned techniques from David that I had never read in books and magazines. It was obvious that working alongside and being taught directly by a master woodworker was the best experience a novice woodworker (at least for me) could have. But there was more to it than that. Being around other woodworkers during intense, exhausting days creates a bond with fellow students and generates an atmosphere that I had never experienced before. You're hunched over your work in fierce concentration and often no one is talking—the sound of working wood is all you hear. You're encapsulated in a little world that's bound so tight, you forget about everything else—work, obligations, responsibility. It's heaven. A class I took a few years ago on making a panel raiser plane was 4 grueling days of woodworking. On the last day as we were packing up, the men initiated a long, drawn out "take-care-it-was-great-to-meet you-hope-to-see-you-again hugfest." I couldn't believe it. My friend can't wait to enroll in another class and I just signed up for one at Olde Mill Cabinet Shoppe. He brought back memories of woodworking class Nirvana and reminded me of an experience that's easily worth every penny.